The BBC's latest production is as absurd as it is transparent and abhorrent. February 11, 2016 (Tony Cartalucci - LD) - Upon reading the increasingly desperate headlines pumped out by the Western media as Western-backed terrorist forces begin to fold under an effective joint Syrian-Russian offensive to take the country back, readers will notice that though the term "moderate rebels" or "moderate opposition" is used often, the Western media is seemingly incapable of naming a single faction or leader among them. 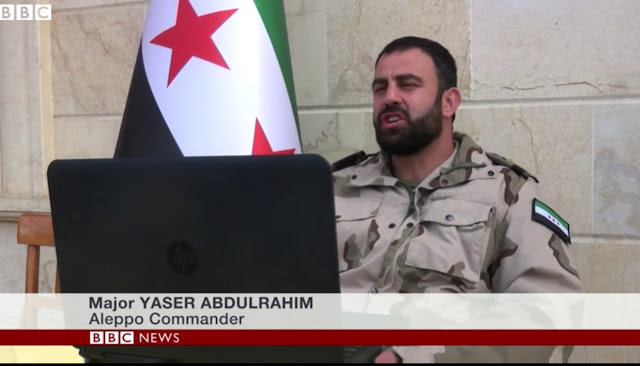 Image: If Major Yaser Abdulrahim looks like he's never wore his FSA uniform out into the field, that's because he hasn't. He is not a member of the FSA at all, and is instead a commander of the Fatah Halab, an umbrella group for Al Qaeda affiliates armed and funded by both the US and Saudi Arabia. The reason for this is because there are no moderates and there never were. Since 2007, the US has conspired to arm and fund extremists affiliated with Al Qaeda to overthrow the government of Syria and destabilize Iranian influence across the entire Middle East. The "catastrophe" the Western media constantly cites in its increasingly hysterical headlines is the predictable manifestation of not Syrian and Russian security operations ongoing in Syria today, but of the conspiracy described by Hersh in 2007 that has indisputably been put into play, starting in 2011 under the guise of the so-called "Arab Spring." When the West does attempt to give names and faces to these so-called "moderates," it is a simple matter to trace them directly back to Al Qaeda. Image: Faylaq Al-Sham's flag is clearly seen in the video of the BBC's fake FSA commander when out in the field. Yaser Abdulrahim is seen out among other terrorists, missing his crisp, brand new FSA uniform and devoid of any FSA insignia. Despite appearing in a brand new, crisp "Free Syrian Army" uniform never worn once into the field, and sitting beside an equally pristine "Free Syrian Army" French colonial flag, Yaser Abdulrahim has absolutely no affiliations with the otherwise nonexistent "Free Syrian Army." Instead, he is a commander of Faylaq Al-Sham, composed of Al Qaeda terrorists and Muslim Brotherhood extremists. 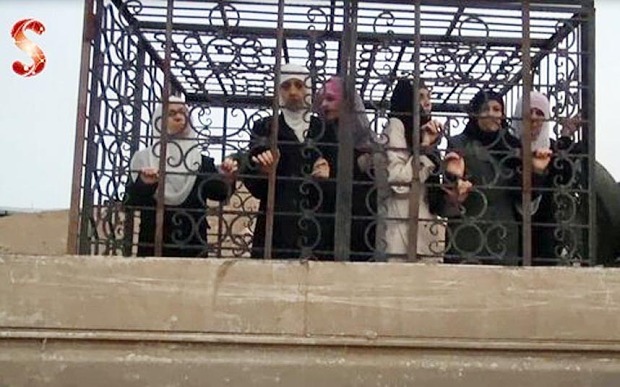 Faylaq Al-Sham and its commander Yaser Abdulrahim, according to Sommerville himself, are part of the larger Fatah Halab umbrella group which also includes Al Qaeda affiliates Ahrar ash-Sham and Jaysh al-Islam - the latter of which literally placed civilians in metal cages on rooftops to use as human shields against Syrian-Russian airstrikes. In the course of fighting between armed groups and government forces in the nearby `Adra al-`Omalia in December 2013, Jabhat al-Nusra and Jaysh al-Islam abducted hundreds of civilians, mostly Alawites, according to the United Nations Commission of Inquiry on Syria. The hostages, many of them women and children, are being held in unidentified locations in Eastern Ghouta. The concern is that they are among those in these cages. The Human Right Watch report is also very alarming, considering it implicates Jaysh al-Islam, a member of Yaser Abdulrahim's Fatah Halab, as collaborating and fighting alongside US State Department listed terrorist group, Jabhat al-Nusra. It appears, ironically enough, that through the deception of the Western media, al Nusra has been amply assisted in fully hijacking "the struggles of the Syrian people for its own malign purposes." Image: BBC's "US-backed rebel commander" heads a faction that includes the terrorist Jaysh al-Islam faction who caged civilians and used them as human shields outside of Damascus. The US insists that Syria and Russia must negotiate with such organizations and that such organizations should play a role in Syria's future. 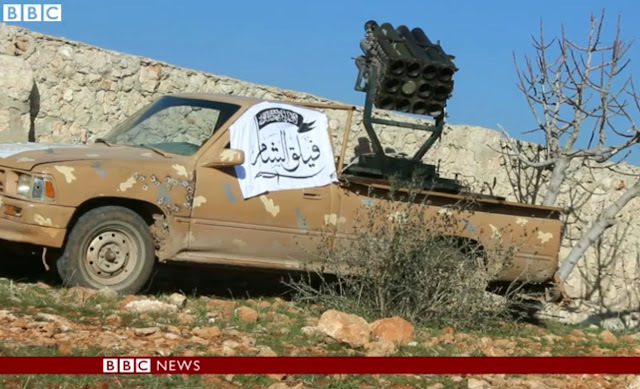 The BBC's abhorrent dressing-up of literal members of Al Qaeda and their affiliates in their recent interview fits into a larger pattern of deceit aimed at salvaging the conspiracy described by Hersh in 2007, but upended when in late last year, the Russian Federation upon the invitation of the Syrian government, intervened in the conflict. With Aleppo teetering at the edge of liberation from what are clearly terrorist forces - the BBC's propaganda and propaganda like it being propagated by the West represents a cynical attempt to perpetuate - not end - the suffering of the Syrian people. 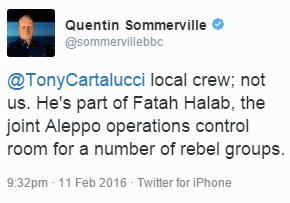 What is worse still, is that the BBC claims their Fatah Halab-Al Qaeda umbrella group commander dressed as a member of the "Free Syrian Army," is "US-backed." This is either an attempt by the BBC to further deceive their audiences as to who the man they interviewed really was, or an inadvertent admission that the United States is in fact funding the very terrorist groups and their associates, populating their own US State Department list of foreign terrorist organizations. Whatever the case, the fact that even a carefully staged production like the one published by the BBC is easily exposed as a deliberate attempt to cover up the terroristic identity of what's left of the West's "rebels," adds further imperative to the Syrian government and their Russian, Lebanese, Iraqi, and Iranian allies to end the war and fully restore order to the entirety of Syria's territory. To negotiate with "rebels" who are clearly terrorists dressed in literal costumes, is an absurdity the West would never accept foisted upon them - thus, no other nation on Earth should accept the West foisting such terms upon them.